Here's the phone from another angle, showing the panda color scheme. 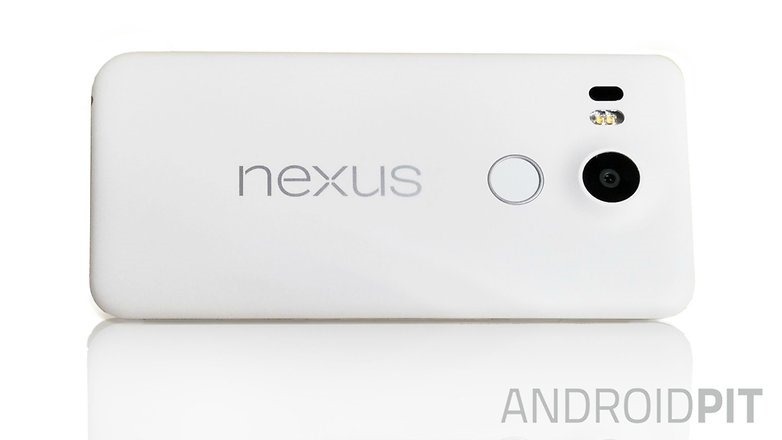 The image you're seeing above is the LG "Nexus 5" (Nexus 5X is in the running for the retail name), leaked by AndroidPIT this morning. We can confirm the image is legitimate. The only detail I'd note that might be wrong on this image is that we'd previously seen an LG logo along the bottom of the device (below the Nexus logo), though it's possible this will only appear in some markets or that it was removed from the final design of the device. Otherwise, this is the real McCoy - you will likely not get a usefully better look at the back of the upcoming LG Nexus phone until launch, if you ask us. What does the picture tell us? Well, the USB connector is obscured, so we can't confirm the type C connector we rumored last week, but we do see a fingerprint scanner, dual-LED flash, what looks like a laser auto-focus module, and of course a camera (12.7MP is the resolution we've been given). To recap, we know the Nexus 5 will have a Snapdragon 808 processor, 3GB of RAM, a 5.2" 1080p display, 16/32GB of internal storage, 2700mAh non-removable battery, and will come in white, black, and blue variants. The white, by the way, is the "panda" style, with a black front / partially black sides and a white rear cover. At this point, September 29th seems like the most probable announcement date, so you've got another three weeks-plus to wait until Google gets on stage (or doesn't, who knows how they'll announce them) to officially reveal the latest Nexus handsets.